Moving to fulfil its budget promise and address political heat over farmer discontent, the government is set to announce a new minimum support price regime that will provide farmers a profit margin of 50% over cost of production and the additional bill is likely to be around Rs.33,500 crore. The new MSP, to be considered by the cabinet on Wednesday, will largely apply to paddy and pulses but will benefit ‘nutri-cereals’ like millets the most. The added cost of MSP is indicated at 0.2% of GDP in the cabinet note. The share of paddy in the additional outgo will be around Rs.12,300 crore. Moving away from a focus on rice and wheat, a range of crops will be covered by the promised MSP and a procurement mechanism will be announced later. The maximum weight in calculating cost of production has been accorded to labour which is about 53% while other costs like fertilisers, farm animals, pesticides, seeds and irrigation add up to the rest. 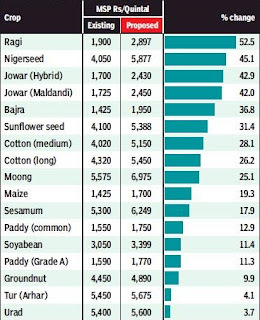 The main Kharif crop, however, remains paddy. The revised MSP will be Rs.200 higher than the current Rs.1,550 per quintal. Last year, the procurement of paddy stood at 38 million tonnes. Farmers in some states are already getting a price that equals or exceeds 150% of production cost and this will remain untouched. States such as West Bengal, Assam and Maharashtra, with lower yields and productivity, will gain. Though procurement of pulses, oilseeds and cotton is done under a ‘price support scheme’, the procurement method has suffered from shortcomings. 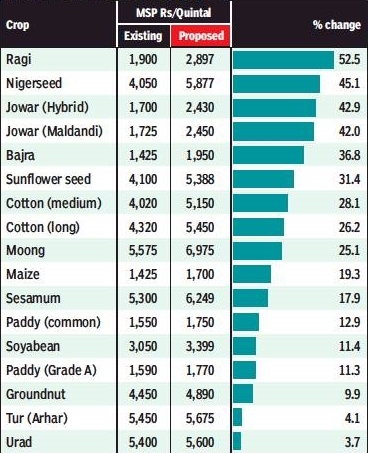 At present, farmers get lower than MSP prices for a majority of the 23 notified crops including groundnut, soyabean, ragi, maize, bajra and jowar. For procurement of these farm products, the government will compensate agencies concerned for losses. It is learnt that the government is ready with a mechanism which includes market assurance scheme. The MAS involves decentralised procurement and disposal by state agencies. The second proposal is the price deficiency payment scheme — like ‘Bhavantar’ in Madhya Pradesh — while a third option involving private agencies is not being considered. The cereals will be used in the food security programme, reducing the costs of holding and disposal. The Centre had in April notified millets as ‘nutri-cereals’ which are not only a powerhouse of nutrients but also are climate resilient as these crops consume less water and can be grown in drought prone areas. More widespread MSP could help diversify cultivation of non-cereals. Procurement of winter sown crops (Rabi) is in progress since April based on MSP announced by the government last year. The MSP of most Rabi crops — wheat, barley, gram and lentils — already provide more than 50% profit to farmers over the cost of production.